Gestation is the period of time when the baby is conceived and developed. Gestation comes from the Latin word “gestare”, which means to bear or give birth to. 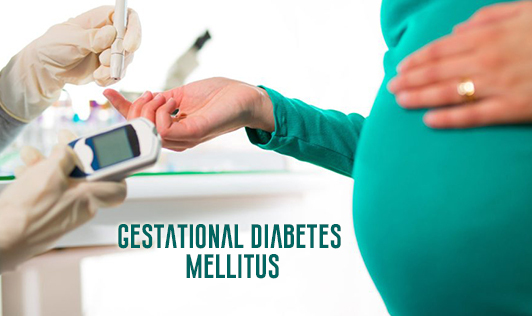 Gestational diabetes is a form of diabetes that occurs during pregnancy and usually goes away after the baby is born. Pregnant women who have never had diabetes before but who have developed high blood glucose (sugar) levels during pregnancy are said to have gestational diabetes. It usually occurs around the 24th to 28th week of pregnancy. In pregnancy, the placenta (the blood source for the baby) produces hormones that help the baby grow and develop. Some of these hormones block the action of the mother’s insulin which is called insulin resistance. During pregnancy, to keep the blood glucose levels normal, the mother's body needs to make 2 to 3 times the normal amount of insulin due to this insulin resistance. If the body is unable to produce the extra insulin or becomes more resistant, gestational diabetes develops. The signs and symptoms are similar to type 2 diabetes which includes sugar in urine, unusual thirst, frequent urination, fatigue, etc. Doctors either use blood tests, glucose challenge test or the oral glucose tolerance test to diagnose gestational diabetes. If untreated, both the mother and the baby are at risk. The baby may be born premature or weigh too much-causing complications during delivery, or an increased chance of miscarriage, whereas the mother is likely to develop preeclampsia or develop diabetes later in life.